If you don't know, certain Broadway shows (in New York) reserve some seats and hold lotteries to sell those seats at discounted prices. Why? Probably so that people can spread the word about their shows on social media. 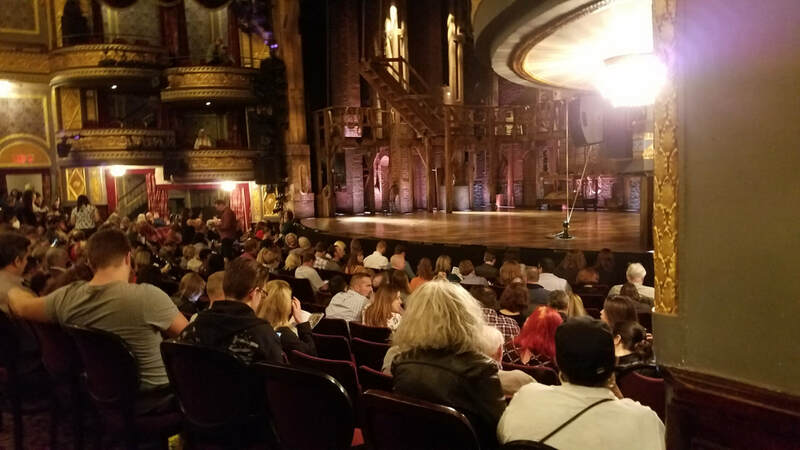 Hamilton is the show that everyone wants to see. The tickets are $10 (+ $2 fees) (which is $20-40 cheaper than other show's lottery seats), and the seats are located in the front rows of the theater. And the show itself is superb. 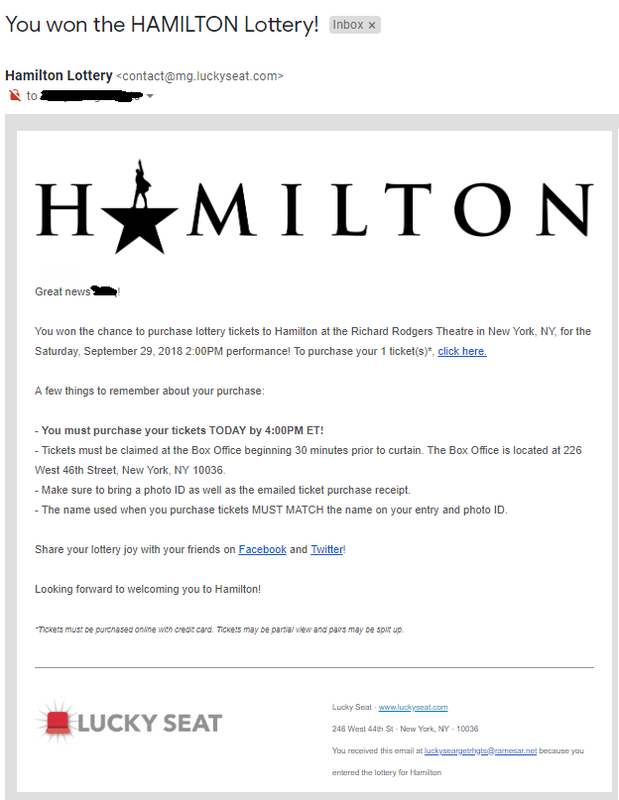 I entered the Hamilton lottery on the morning of Friday September 28th, 2018. At 9 AM, the lottery closed. At 9:35 AM, I got an email saying I had won. After a few minutes of joy, I followed the link in the email and paid the $12 for the ticket (I only entered for one ticket)* and got an email receipt. * I would've loved two tickets, but I entered for one because I figured it was easier to accommodate one person rather than two, and would have better odds. But a lottery is still a lottery, and it takes luck to win. Statistically I won once and got exactly 22 rejections. How Much Are Seats Normally? This is from the day before. The day of the performance, everything was sold out. The play I won was scheduled for 2 PM on Saturday. I live in Long Island, so I took the LIRR and got to Penn Station (34th street, 8th Ave) at 1:23 PM. 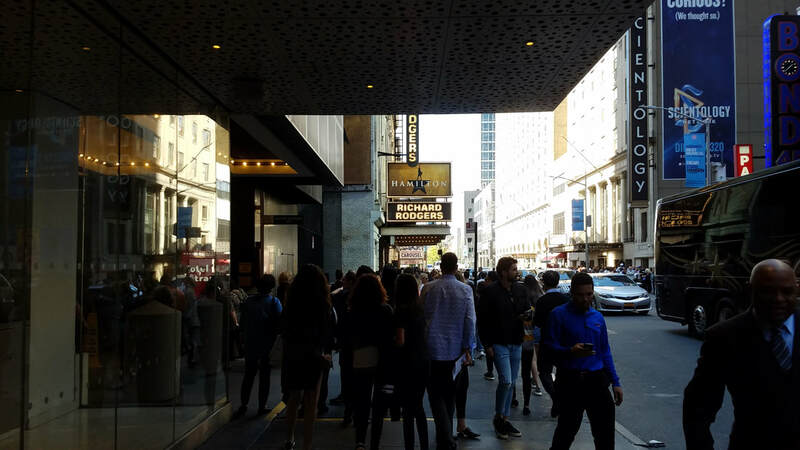 By the time I walked out of the subway up to the street, and power walked past tourists to get to the theater on 46th street, it was 1:40 PM. People who bought their tickets online had printed their tickets from home went on line to get in. 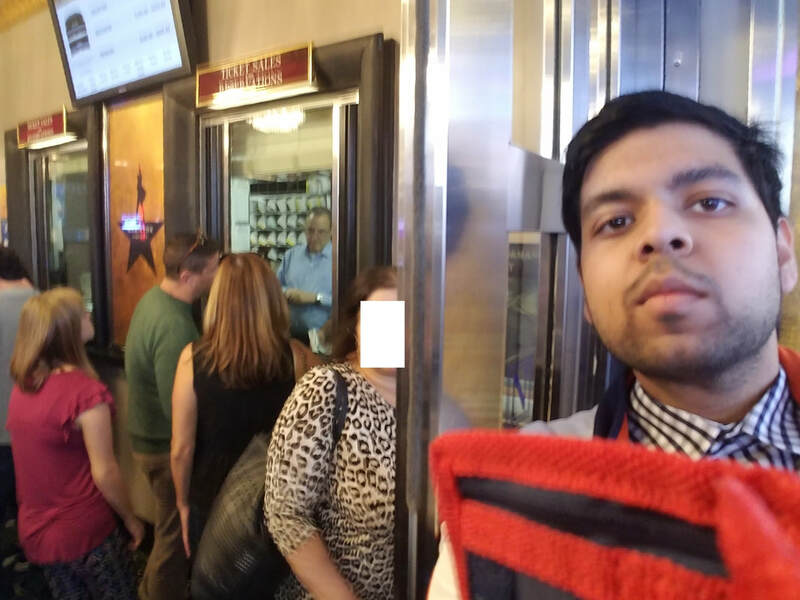 Lottery winners (or anyone picking up tickets) had to stand on a special line to go to will-call (which was in the entry-way to the theater). Quick selfie in front of will-call. Before picking up my tickets. You show your id, and the person behind the counter gives you your ticket. Then you walk two steps, get your ticket scanned, and are allowed inside the theater. The lobby (the place as soon as you enter) was super packed. To the left, there's a bar, a staircase for people with balcony seats, and a concession stand. 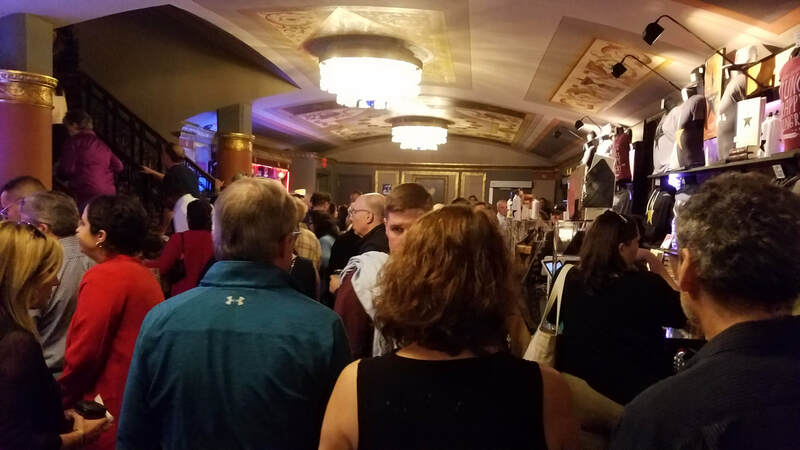 To the right, there are two entrances to the theater, two entrances for the men and women's bathrooms (which are downstairs, but it's really nice), and two merchandise stands. When you enter the the actual theater, an usher will look at your ticket, and guide you to your seat. People kind of socialize before the play and during intermission. My seat was in the center, in the second row, on the aisle. Right next to where the lady with the gray sweater is standing. 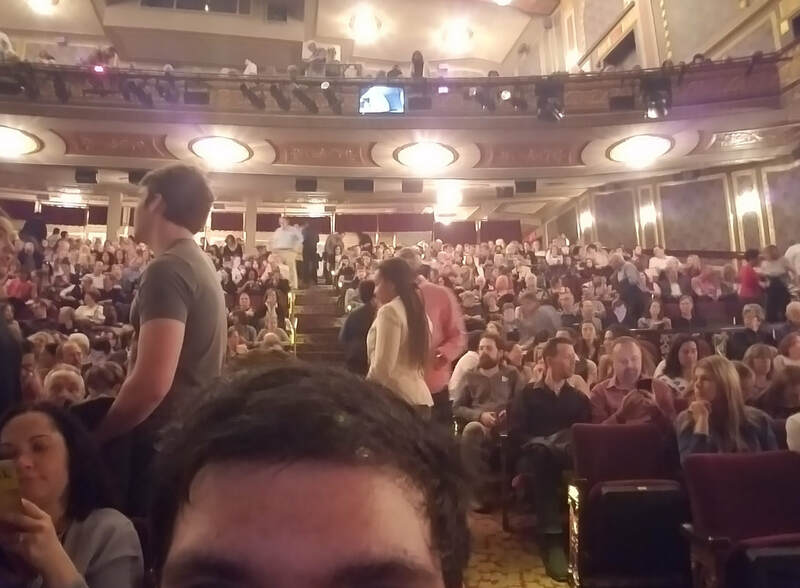 A very quick selfie before the play started. A look behind me. (Remember, I was in the second row.) The balcony is up top. 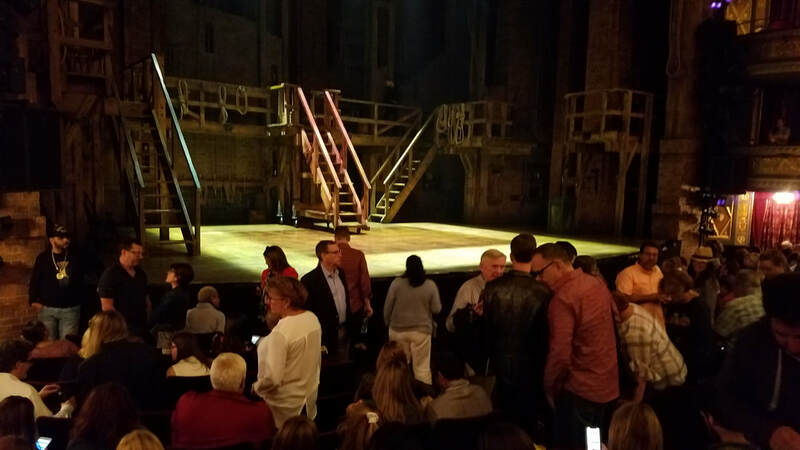 I'll be honest: I'm not into musicals at all, but Hamilton was really good. The story and pacing were really good, the singing/rapping/audio/music were excellent, and the costumes and props were fun. 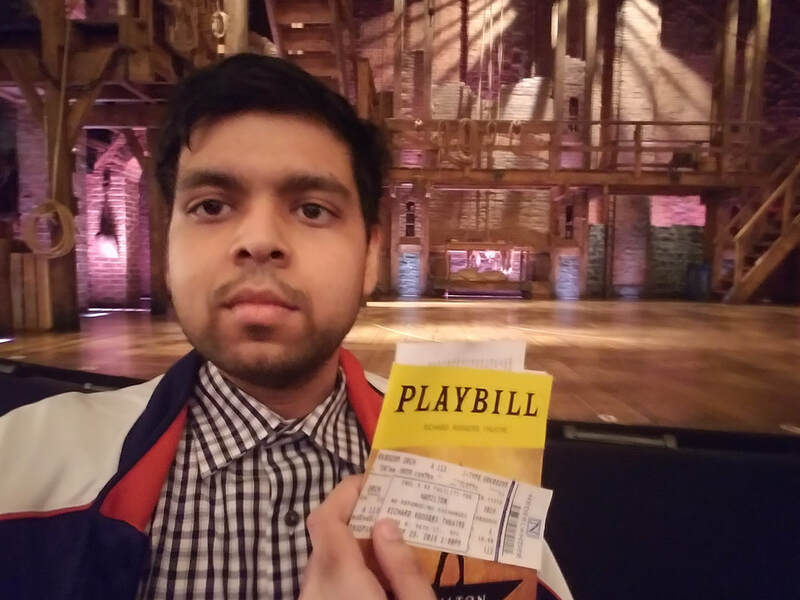 I'd honestly say Hamilton is a 10/10 play, probably the pinnacle of broadway shows. And $10 for a front row (second row) seat is pretty good. The experience as a whole was really great, even for people who don't like plays.